From Muse guitar tech Jason Baskin: "...a hold pedal for the reverb pedal in there"
The Boss FS-5U Nonlatching Footswitch is seen in Steve Vai's pedalboard during a rig rundown. Eric Clapton uses these footswitches to work with his complicated pedalboard system which he uses now and then. The Boss FS-5U Nonlatching Footswitch can be seen at 29:37 of this "Rig Rundown" with *Premier Guitar*. At 18:14 in this video, Kirk Hammett's rig is also shown to consist of a Boss FS-5U. Rudess used this pedal when they played at Luna Park. The item can be seen 1:44 into this video. "Used as a tap tempo for his Boss DD5’s." 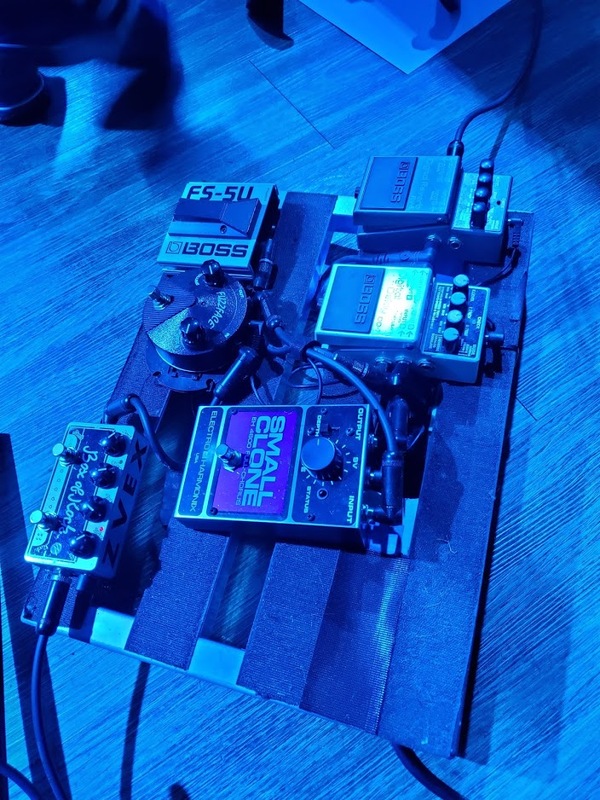 In this pedalboard photo, which was uploaded by Bynum on his Instagram profile, one of the pedals that can be seen on the board is the Boss FS-5U. "Aw @KodalineRoadie got me a new @pedaltrain board :-) he's a good lad sometimes"
The Boss footswitch can be found off the board at the far left side. It's connected to the G2 Switching System. Like Chris Miller, Max has a Boss footswitch attached to the G2 switching system. At 10:30 in this Rig Rundown for Lindsey Buckingham of [Fleetwood Mac](http://equipboard.com/band/fleetwood-mac) and [Buckingham Nicks](http://equipboard.com/band/buckingham-nicks), his gear is displayed, showing a Boss FS-5U Nonlatching Footswitch. He shows a Boss footswitch at around 0:20. He uses it for his Boss Harmonist pedal. A Boss FS-5U can be seen on Lee's pedalboard at 16:00 in this rig rundown video. In conjunction with the Boss GT-6, Mark has two Boss footswitches which sit to the left of the processor. In this photo, which comes from the 2013 Visions Festival, the Boss FS-5U nonlatching footswitch is visible in Callinan's board. Seen at [20 seconds](https://youtu.be/o74iygYCXDw?t=20) just below Anthonys hand is the Boss FS-5U. In this video the artist shows this gear starting from 14:20 minute. "I noticed you have an FS-5U Foot Switch with your DD-7 for tapping in the delay time. Do you tap in the rate at different tempos? Yeah, all night long. I have some analog delays, too—which I use because they have a cool sound to them—and I put them before the DD-7. Then, I use the DD-7 to tap the analog delays. Because the DD-7 goes last, it sets the tempo of the other delays. Even if they’re out of tempo, the DD-7 will loop them at the appropriate tempo." The pedal is visible at 2:29. We can see all his pedal board at 40:48. He uses it at 1:28 to change the channel of the loop station, to record the kick sound on his guitar. He uses this as the tap tempo on one of his boss dd-5 delays. In the Facebook photo taken by Erin regarding his new Pigtronix Looper, he has a Boss footswitch on the far right side. From a [Guitar World Article](http://www.guitarworld.com/caspian-s-guide-creating-wall-sound-four-essential-pedalboard-tricks), Jonny's pedalboard has a Boss footswitch to control his digital delay. He has one plugged into his Boss RC-3. He uses it in combination with the switch built into the pedal to have more room to turn the loops on and off immediately. 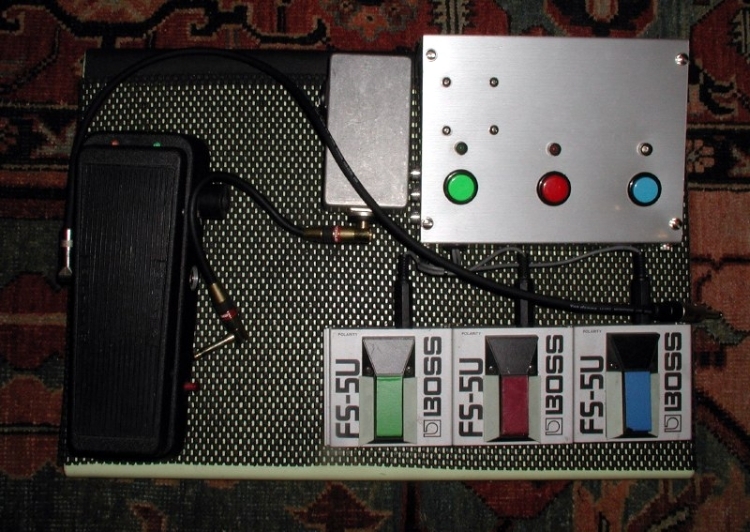 In [this image from Rhodes' website](https://david-rhodes.uk/images/about/gear/2014_btf/Pedalboard%20BtF.JPG), an FS-5U can be seen on his pedalboard. Shown in the fourth image of this tweet. This is the no-compromise go-to pedal for a non-latching footswitch. Built like a tank, it will most likely outlive you and your band members, even if you all go to war. With a side switch to toggle between "normally open" and "normally closed" states, this pedal covers every use you can imagine. Use it for all your unlatching needs! I use the FS-5U with my Boss DD-7 perfect for tap tempo! for there were no more mountains to conquer in the world of single-non-latching foots-witches. Life cruel sometimes -this is how life compensates. Thanks life. Does what I need. Built like a tank. Right now, I use this as a tap tempo for my Boss AW-3 Auto Wah. I've used it for lots of other things in the past. It's solid and, if you need more than one, you can lock them together with a mechanism that's part of the case design.